Lately there has been a lot of attention going to Content Marketing. Although it’s one of my favorite subjects, blindly going for a content marketing strategy can be dangerous. When developing your content marketing strategy, you start developing a process to position content along the buying cycle, or even better: along the complete customer life cycle. Every piece of content needs to drive the buyer further down the buying cycle, or increase the satisfaction level of existing customers. Having a good content creation process that inherently has checks built-in to make sure the right Call-To-Action (CTA) is assigned to each piece of content. These CTA’s are developed to progress your buyer through the buying cycle. Marketing automation techniques like the ones I described in this post can be used to automate some of your work. 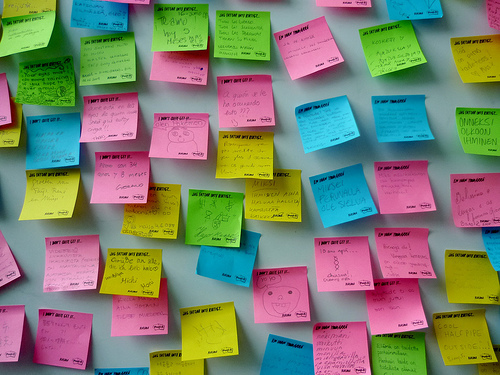 So when implementing content marketing: don’t forget what you want to do with your content. In the end, you are doing this to do business! But what should not be forgotten is that your potential buyers must be activated and sometimes pushed at the right time and that you cannot influence the entire DMU (decision making unit) through content. You also need people doing lead management and account management, and knowing how to close a deal. A nice blog post about this from Jon Miller can be found at this location. You as a marketer might be convinced that interruption marketing doesn’t work anymore. You are convinced that you need to be where your buyers are, weather being found through Google, or by providing valuable content that helps your buyers on Youtube, Slideshare or your blog. But that doesn’t mean other people in your organisation understand that this change in marketing also concerns them. So when implementing content marketing: your organisation needs to go through a change management process to get people on board. Even with dramatic statistics about advertising like these, you still need media, advertising, tradeshows, etc… that support your brand. If you really want to get to market fast with new products or service, great content and relevant advertising promoting products or services are a great combination. Getting access to new markets and new geographies need outbound marketing. If That’s part of your strategy, pure inbound marketing won’t cut fast enough for you. CEO’s still take airplanes and see billboard ads in the airport. People still read magazines and are consciously or sub-consciously influenced by brand that bring great advertisements. They cannot NOT be influenced by it. So done right, they still have value. A great infographic about the difference between inbound marketing and outbound marketing can be found here on Mashable. Content marketing can do a lot for your business, but if you don’t have strong products, it’s difficult to make the difference in your content. Being able to listen to the needs of your markets, and translate them into remarkable products, that’s the key to unlocking the power of content marketing. As in everything, a good balance is important. If you feel that you are spending too much on outbound marketing, why not shift some of the effort to content marketing? Make it a dedicated project within your organisation and don’t go the pragmatic route (you might never get there). Get your organisation on board (if not, your project will not catch on and be less impactful as opposed to what it can really do for your company). Use outbound marketing where necessary (because if well combined with great content, it still works). Thank your for reading this far. If you are great in content marketing, I would truly appreciate pointing out extra elements that should not be forgotten in a content marketing strategy. And don’t forget: writing & producing inspiring content is a craft! I couldn’t agree more :-). Thanks David.